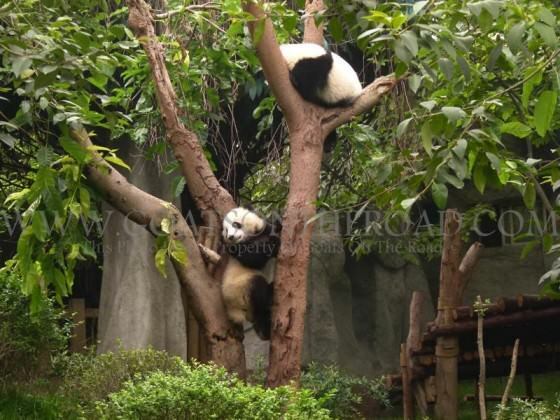 Chengdu, China - Panda Watch! After two nights in a great hostel, it was time to say goodbye to Guilin. We hoisted our backpacks over our shoulders, found the local bus to take us to the train station and began our epic 25 hour train journey to Chengdu in the Sichuan Province. 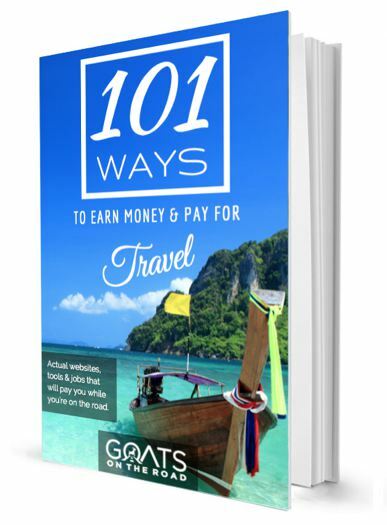 Most people fly this leg of the journey, but we couldn’t find any affordable flight tickets, plus, we always enjoy taking the train; it’s the best way to see the countryside and meet the local people. The first leg was 4 hours on a “hard seater” class. This basically means that you have to sit at a 90 degree angle on a seat with very little padding. For some, it’s a very long journey sitting like this, but luckily for us, we were only on there for 4 hours before switching trains. 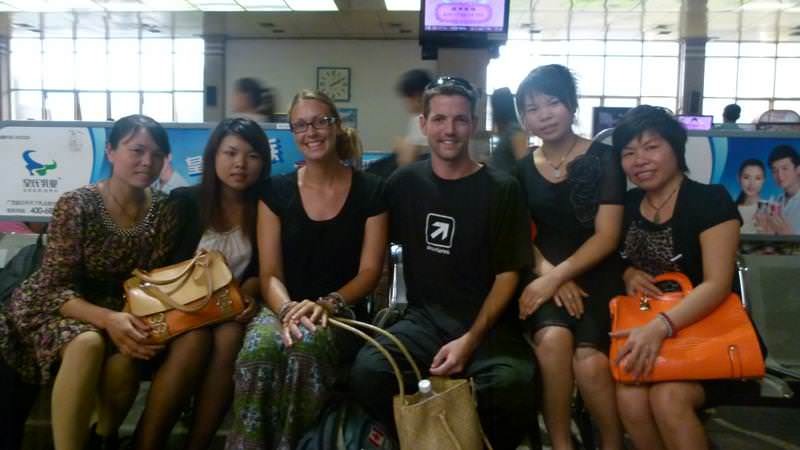 We met some really nice young women on the train who were eager to try out their English. 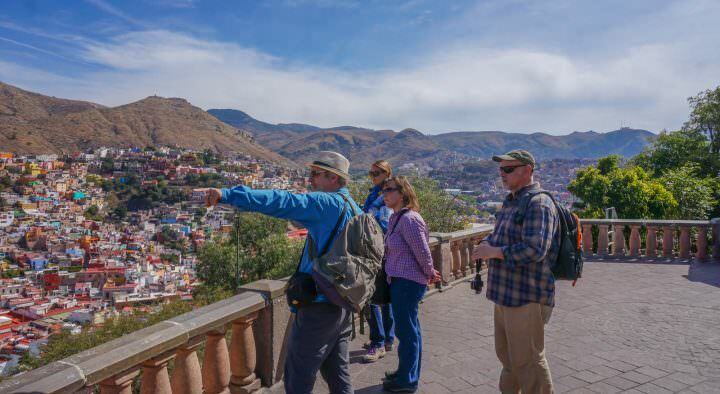 We had our guidebook out and everyone gathered around showing us where they live and we showed them where we had been and where we were going. The older women, who cannot speak English, did their best to join in on the conversation but mainly they were just admiring my bamboo woven bag that I got as a gift from the guesthouse owner in El Nido, Philippines. They all loved it, too funny. at the train station – good luck buying tickets without any English! I don’t know if any of you watch An Idiot Abroad but the guy in the show goes to China and complains about there not being any doors on the public toilets. We had no idea which part of China he was travelling in because we had seen no such thing on our journey thus far. Once we reached our first train station, I had to relieve myself and made my way to the toilet. As I rounded the corner and entered the restroom, there it was, smack dab in my face: women squatting in a door-less toilet going about their business! I didn’t know where to look so I made my way up the centre aisle trying to find a vacant “toilet” to use, but of course in order to find such a thing, I had to peer around the corner of each stall! It was way too early in the morning to be dealing with this, although I’m sure there’s never a right time. To make matters worse, they weren’t proper toilets (Western style or Asian style), it was just a trough with water running through it! You can imagine what it was like watching other people’s waste rushing right underneath me…luckily I was near the start of the trough, and not at the end of the trough. It was a shocker. I’ve never seen anything like it, not even in India. 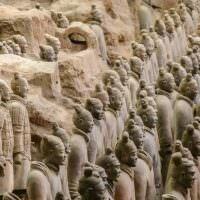 China would prove shocking to us in other ways as time went on…continue reading! We had a little bit of time before our next train came so we were just hanging around chatting. Out of nowhere a woman came by and sat beside us and started speaking Chinese. She was having a full on conversation with us and we were just replying “yep, ok, uh huh, we don’t understand you”. In the end, 2 other women and a man ended up coming over and they all wanted pictures with us. It was hilarious. So we did the photo shoot and then I asked them to take a picture of their shoes. 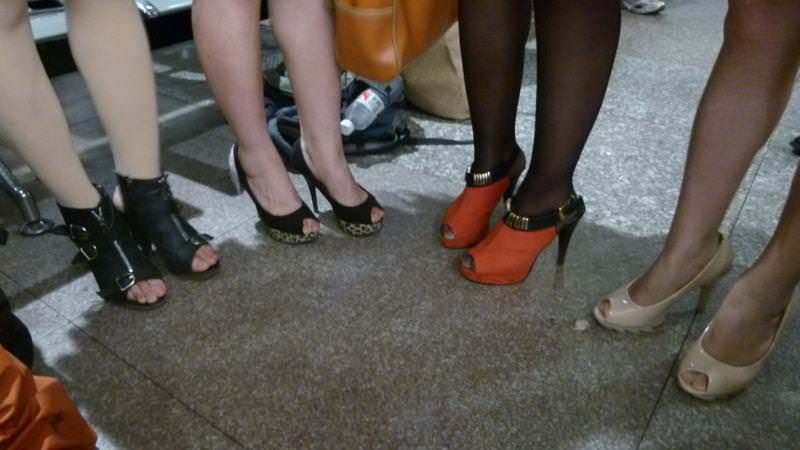 The women in China wear 5 inch heels always. I rarely see a smaller heel. They walk allll over town in them too, I don’t know how they do it. the women and their 5 inch heels! After our chat with the nice people, we were boarding our next train. This time we were on a “hard sleeper” class. 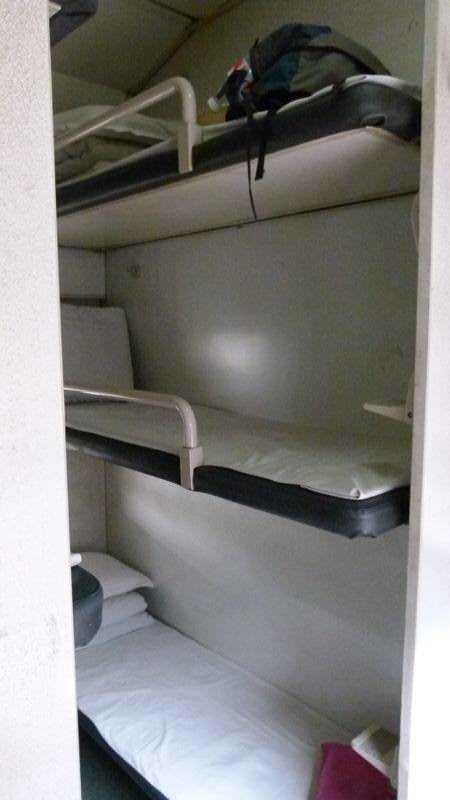 It’s just like a SL class in India, a basic 3 bunk bed system with 6 beds in a cabin. The only difference between these and the ones in India is that in China, the trains are cleaner…but the Chinese people smoke! 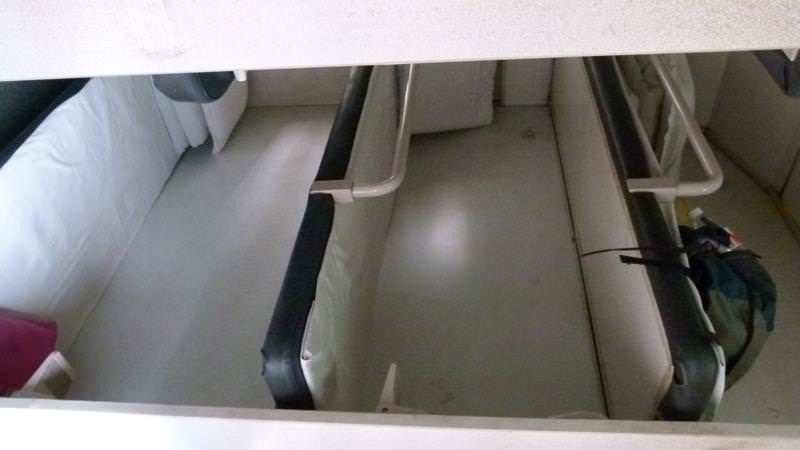 They are supposed to only smoke in between carriages near to the toilets, which is great in theory, but as smoke can travel, it just wafted back in through the rest of the carriage. It wasn’t the greatest ride for us. Also, we were on the top bunks across from each other, which isn’t ideal. The top bunk has the least amount of room, so we couldn’t even sit up without our necks completely bent down; if we had to go to the toilet, we had to climb down from the top, and it’s also where the speakers are located! Being right under a Chinese intercom with a woman yelling about something wasn’t the most enjoyable wake-up call. Even though there was the smell of smoke, a very loud intercom and no a/c on this train, we ended up having a good sleep and woke up feeling refreshed. We made our porridge and cut up our mangoes for breaky and got our things together. 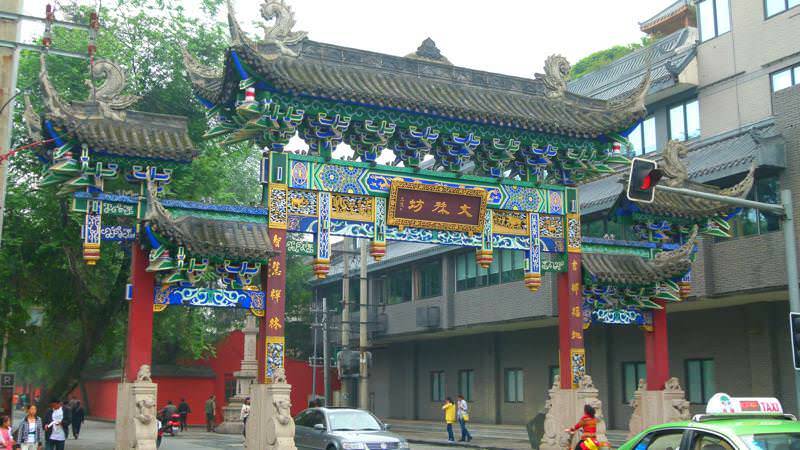 We arrived in Chengdu around 4:00pm and began our trip from the train station to our hostel. We were on a local bus for about a 1/2 hour, then we had to switch to another one. 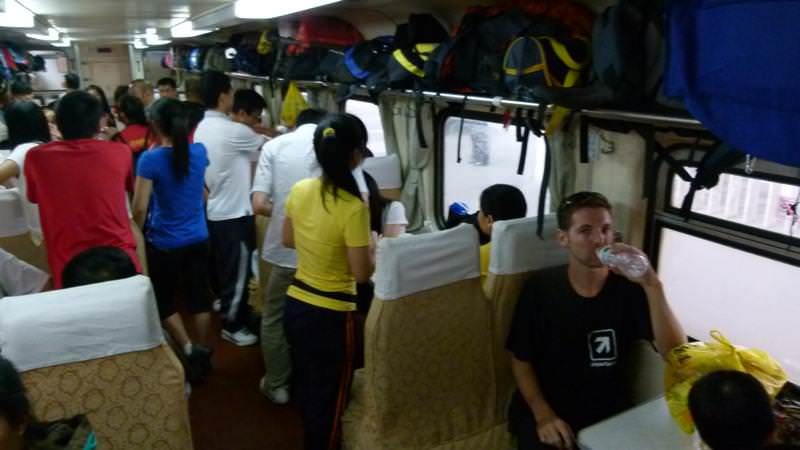 This was the first time we had struggled with figuring out transportation due to the language barrier. 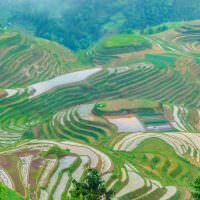 There is hardly any English spoken in China, literally next to zero most of the time. The staff at the hostels are pretty fluent but good luck finding anyone else on the streets or in customer service to communicate with. So, the second bus ride took us awhile. We were searching around everywhere, being pointed in all sorts of directions, our 20kg backpacks felt like a ton of bricks and we were ready to just hail a taxi and get it over with! Luckily, we found our bus and it dropped us off basically in front of the hostel. Phew. 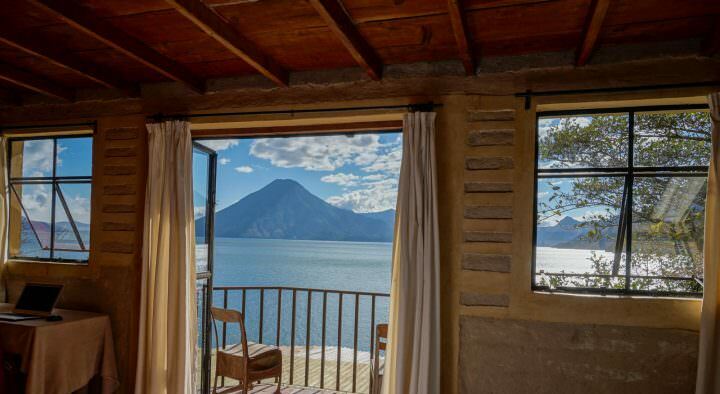 We stayed at Sim’s Cozy Guesthouse and it was fantastic, quite possibly the best one we’ve ever stayed in. This place had every amenity you could imagine: a bar, a restaurant (serving amazing Sichuanese food), 2 garden areas with tables & chairs, a games room with a pool table & ping pong table, a travel desk with all kinds of information and staff who were on the ball about everything. They all spoke great English and were really knowledgeable about their city and about their country. We can’t recommend this place enough. The food was so good at the hostel that we ate every meal there, except for one. 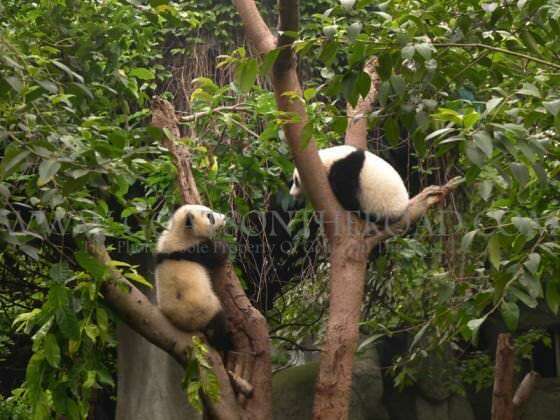 Our main reason for coming all the way to Chengdu was to see the very cute, cuddly and borderline extinct, Panda Bears!! Our hostel offered a tour but as you know, we’re not all that thrilled about taking tours, so we headed off ourselves the next day. We only had to take 2 buses and we were there within an hour. 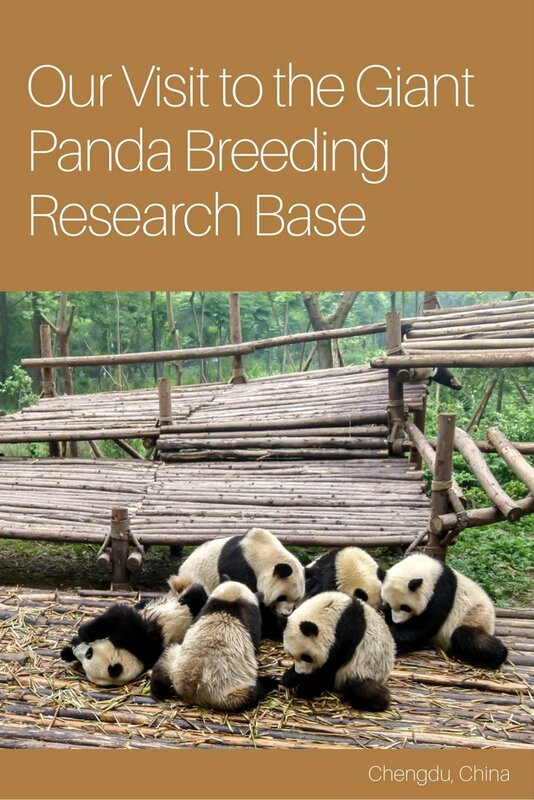 We went to the Giant Panda Breeding Research Base, just outside of Chengdu. 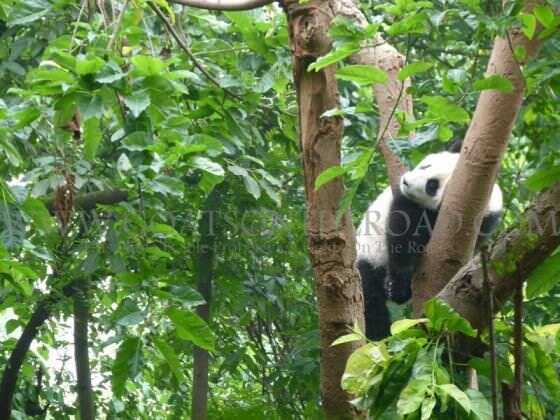 They breed Panda Bears here but unfortunately, the bears aren’t able to be reintroduced into the wild. 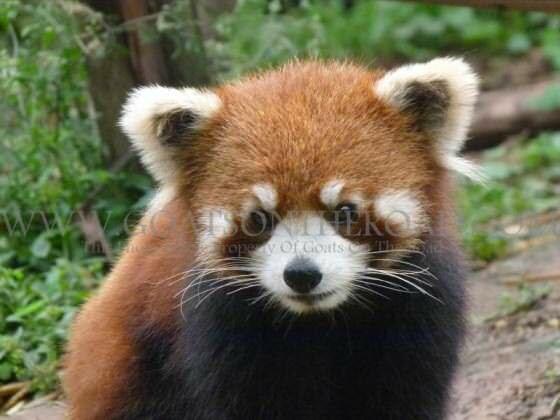 They have become dependent on humans to feed them (their teeth aren’t strong enough to break open the bamboo) and they are even reluctant to mate. 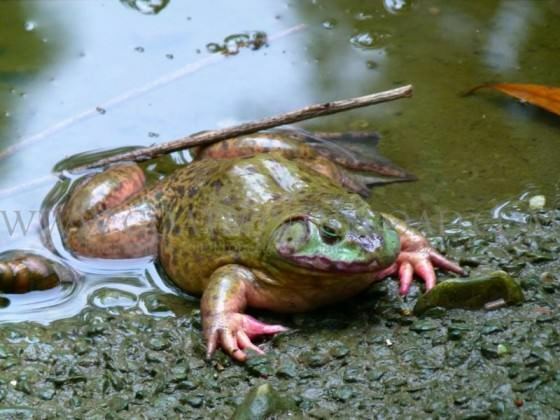 The place calls itself a Wildlife Reserve and isn’t meant to be like a zoo. We found that it was a pretty good reserve, not too zoo-like, but it could have been a bit better for the bears. 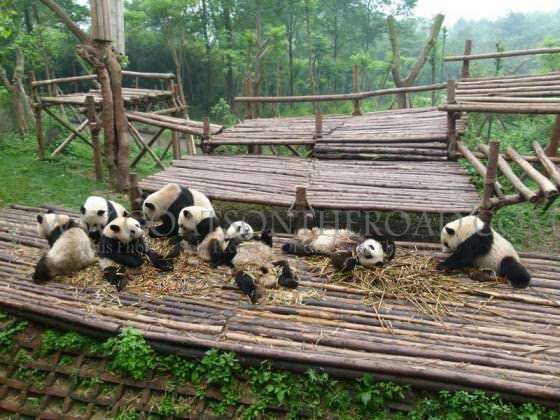 There were many Panda areas full of trees for climbing, grass for playing in and bamboo built structures for them to lounge around on. The only problem was that the enclosures weren’t all that big. They weren’t terribly small, but they could have been a bit larger. 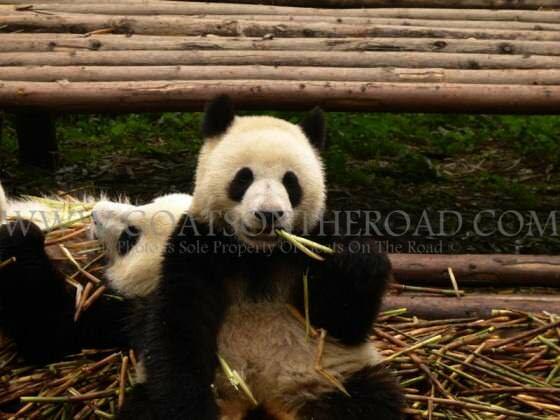 Either way, the Panda Bears were SO cute and they didn’t seem to mind the conditions! There were 2 areas that stood out for us: a group of 7 adolescents and a mom with 2 cubs. These bears have so much personality and sometimes their mannerisms were so human. 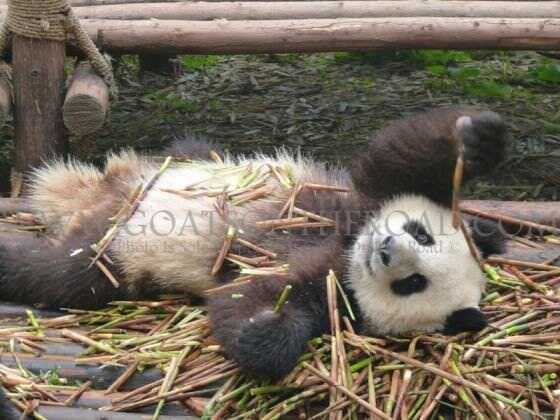 They would grab a piece of bamboo, sit down, lean back against a tree or something and start eating. When full, they would all lounge out on their backs as if they’d just finished off a turkey dinner! It was hilarious. 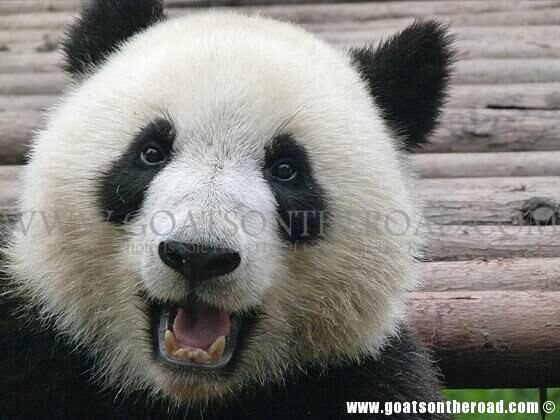 One Happy Panda. Chengdu, China. The cubs had tons of personality as well and one in particular was really rambunctious. He would climb up a hill and then tumble down it to gain the attention of the tourists watching him; he’d jump on his mom and try to roughhouse with her (she wasn’t having any of it) and he spent a long time trying his very best to climb up a tree (quite awkwardly I might add) to where his brother was napping. The scene was so funny and we watched it all go down, laughing at this fuzzy character the whole time. 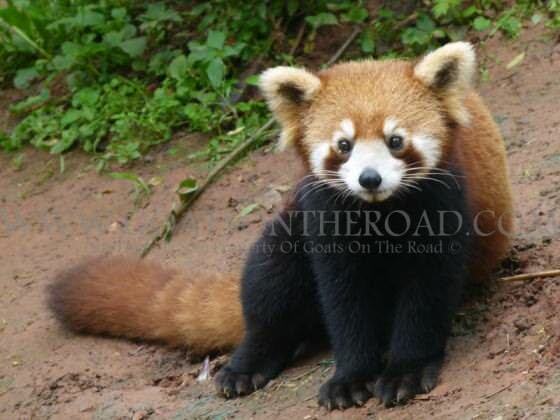 Apart from Giant Pandas, there are also Red Pandas at this reserve. I hadn’t even heard of them before coming here. They look like raccoons more so than bears, but were equally cute. There are less than 1000 wild Pandas left in the world, so we spent a few hours roaming around and appreciating the fact that we were able to see some of the most endangered animals, even if they weren’t in the wild. The following day we were up early to go out and see some of the sights around town. 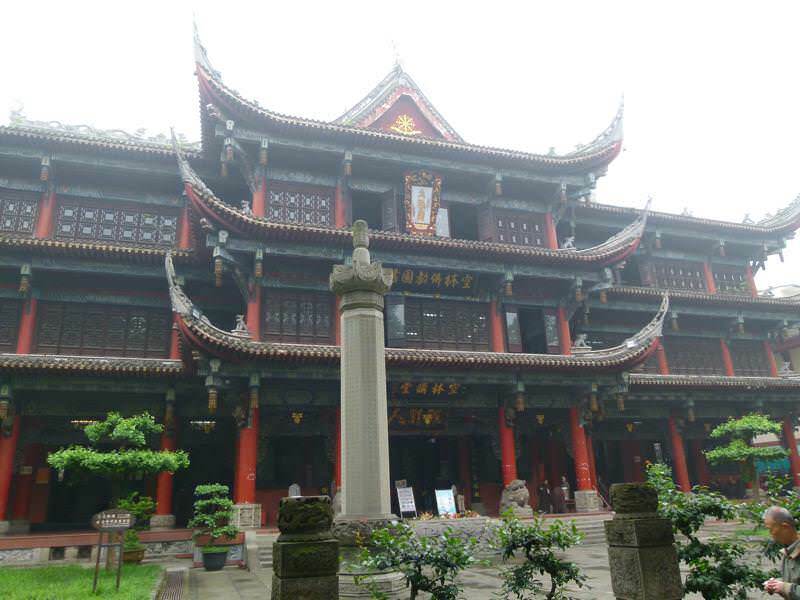 We navigated our way around the subway line and went to a very large, well-preserved Buddhist Temple, Wenshu Temple. 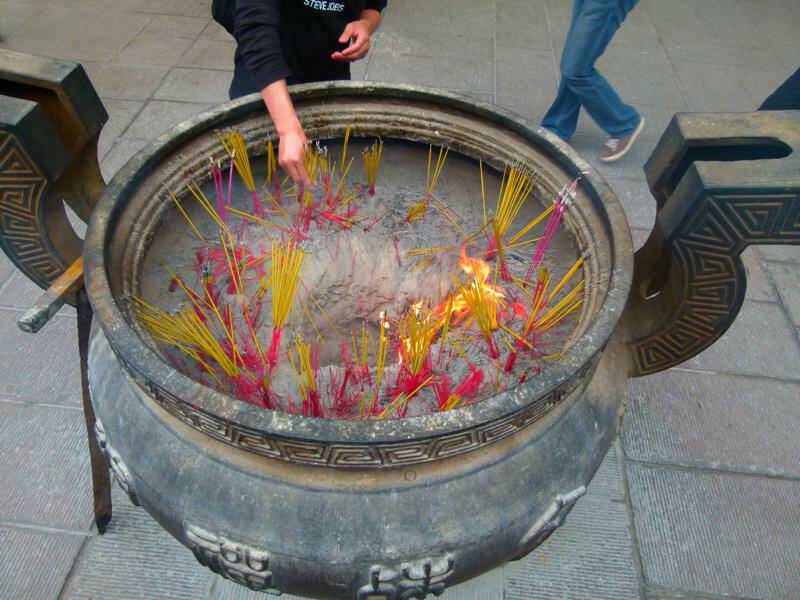 The place was massive and filled with parks, turtles, frogs, monasteries, Monks, and metal urns burning incense sticks as offerings. It was a great place to roam around for a while. 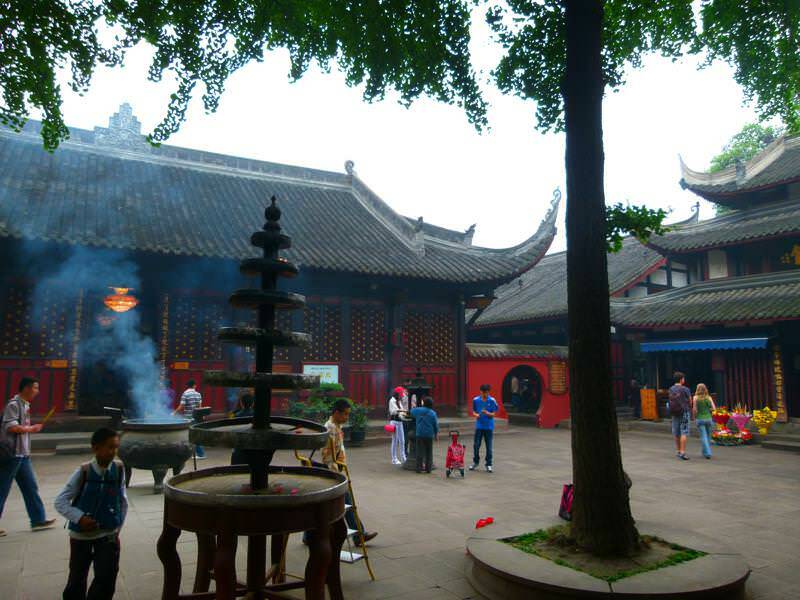 From there we found some backstreets lined with red lanterns, old Chinese architecture and shops. 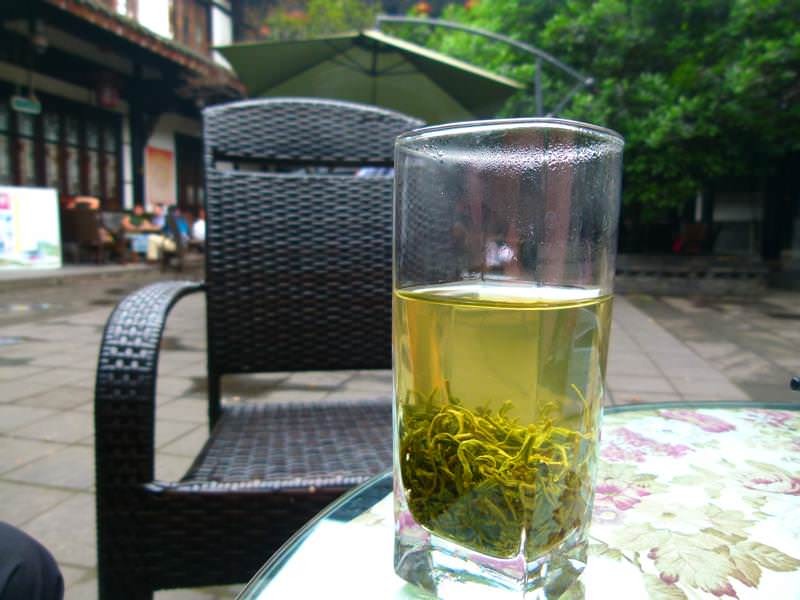 We popped into a tea house and did as the local Sichuanese do, had some green tea and some chats. We didn’t fully immerse in tea-time as they would have it…apparently during this afternoon activity, a man comes around with a metal wire and a paintbrush with a little feather on the end, he straps a flashlight to his head and starts digging deep into one’s ear canal for an ear cleaning! Maybe it would’ve solved my ear equalization and maybe I would’ve been able to go diving, but it didn’t seem sanitary or safe, so we opted out of that one. 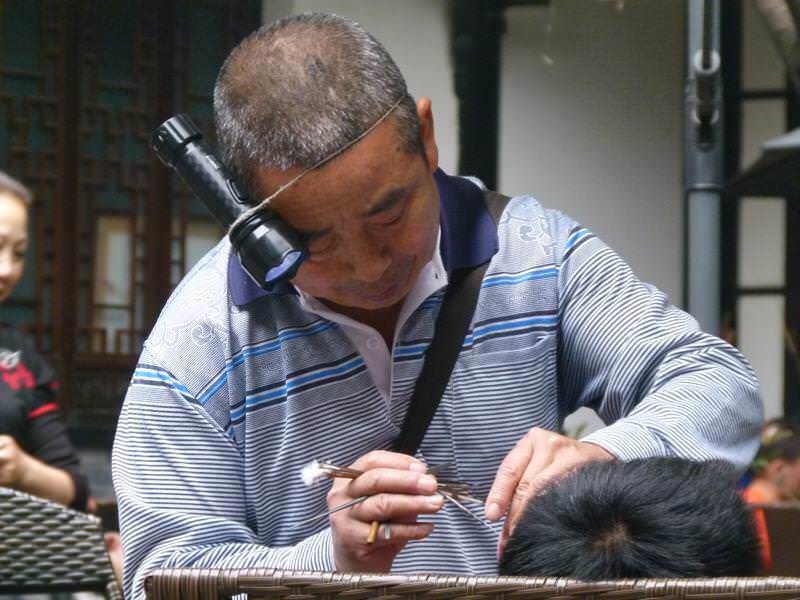 ear cleaning at the teahouse! After witnessing the weirdest thing to happen in a tea house, or anywhere really, we were back on the metro to take us further South to try out the famous Sichuan Hotpot. 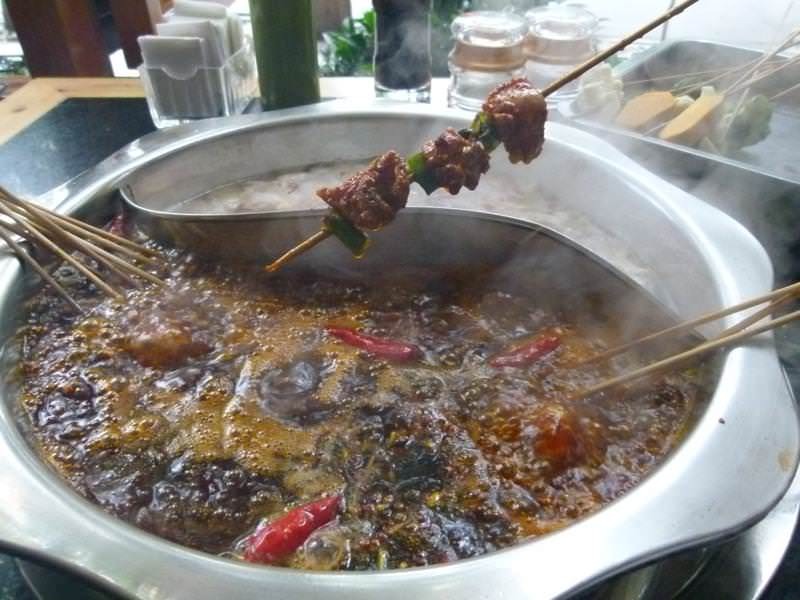 Sichuanese food is known for being full of chillies and very spicy…which we love! Tables are set up with a burner built into the table, the waiter brings out a big, boiling vat of spicy oil, which continues to bubble at your table over the hot element. 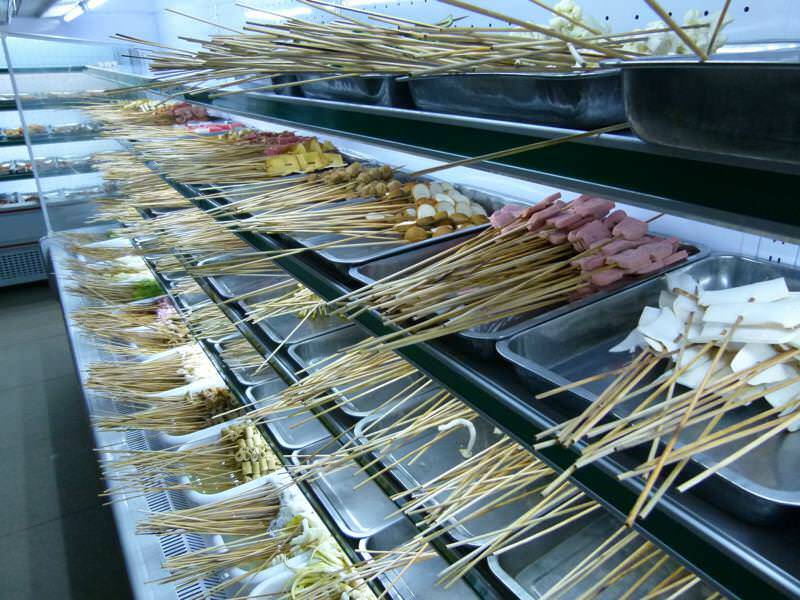 You then go to the cooler room and pick out some skewers of food that you would like to cook up in the bubbly goodness. There were loads of different meat choices (we made sure there wasn’t any dog on the menu), and lots of veggies on offer. We filled up our tin container with beef, pork, chicken, broccoli, cauliflower, sprouts and pumpkin before heading back to our table. It was a pretty fun and interactive way of eating and we ended up stuffing ourselves with the spicy delights. On the way home, we witnessed something so bizarre, so incomprehensible & so ridiculous that it made us stop dead in our tracks. We were told by other travellers (when we had just arrived in China) that Chinese parents will cut holes in their child’s pants so that if they need to go to the bathroom it’s easier access. Ok, fine, we thought. But we didn’t realize exactly what that meant…what it means is that yes, it’s easier access for doing a #1 or a #2 but they don’t do it in the toilet, they do it anywhere they feel like! At this particular moment, we were walking outside of a very posh shopping centre with nothing but Mercedes, BMW’s and Porsches parked outside. The car pulled up, mom came out with her 3 year old child and held her over the beautiful water fountain that was out front of the mall, and there she went. 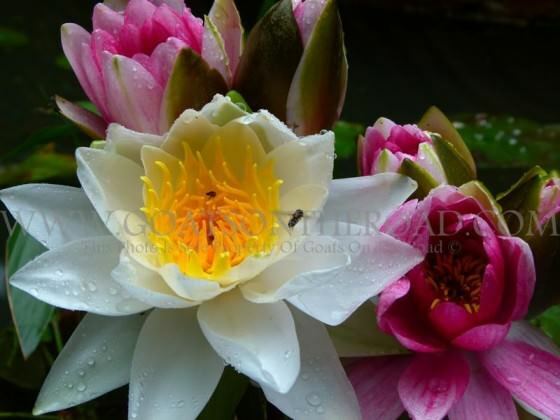 Her pee going into the fountain, and then right back up into the air as the water continued to spray. We were so shocked. A) There’s obviously toilets in the mall they could have used B) In a fountain? Seriously? Clearly the pee is just going to spray back onto everything and everyone and C) no one even batted an eye as they walked by and witnessed this. This would be the first of many occasions we would watch this odd behaviour happen. 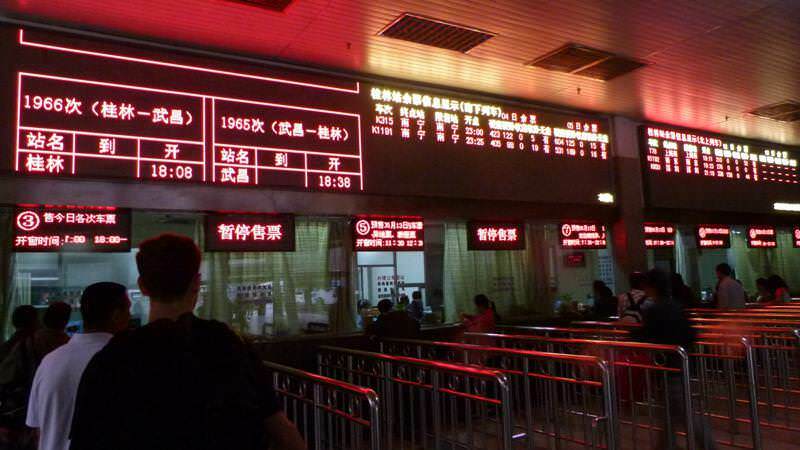 We spent the next day organizing future train tickets, doing some stuff on the internet, getting our last fill of Sichuanese food and then made our way to the train station once again. 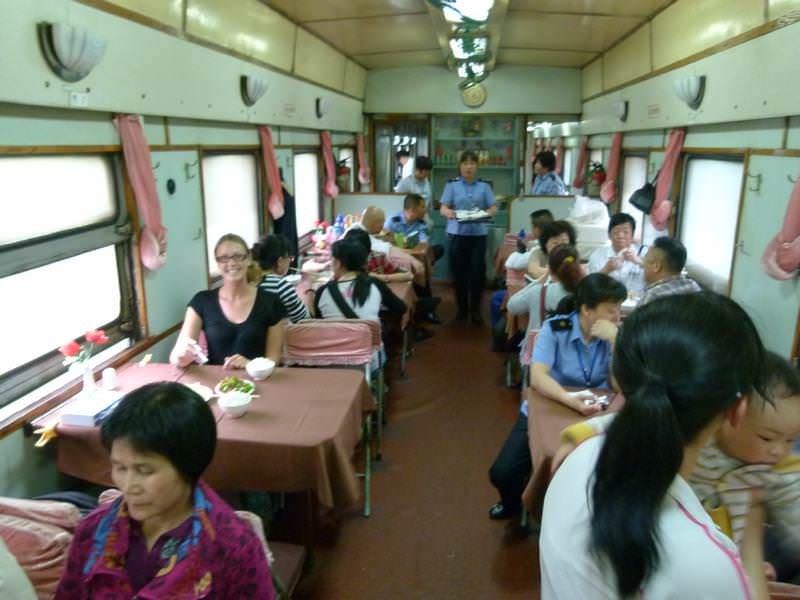 This time we were on an overnight train to the ancient City of Xi’an in the Province of Shaanxi. Our Next Trip is Central Asia: The Most Epic One Yet? Life is all so interesting in Asia. Very cute pandas and very different toilet habits!! We love hearing all your news. Loveland hugs. Oh God!, I would have up-chucked my cookies if I had to see such a sight first thing in the morning…gross! 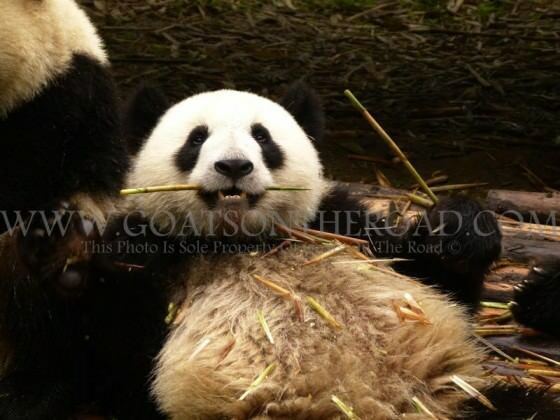 Love the Panda shots guys…they really are cute aren’t they. …and as always you both look happy and in love. My boyfriend and I are backpacking Asia as of the 13th of April. 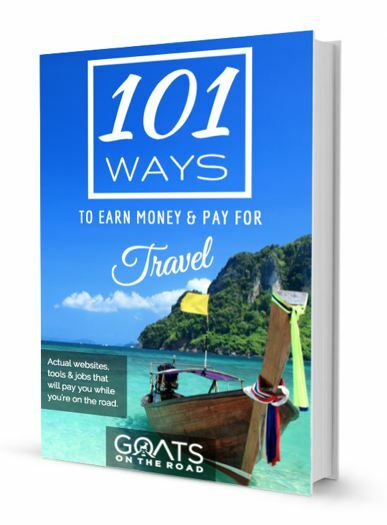 I have been reading pretty much everything you have to offer regarding Thailand, The Philippines, Cambodia, Indonesia, Malaysia and China as these are the places we are going to visit. 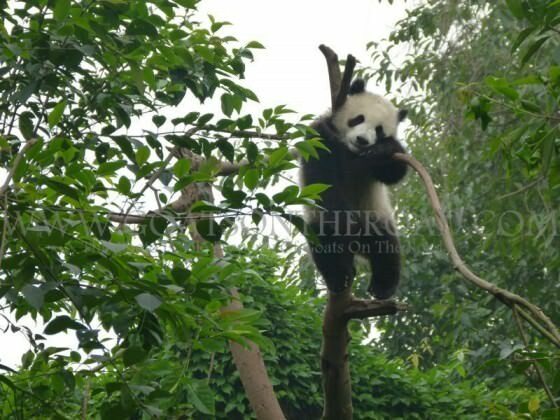 This article was very helpful as we are visiting Chengdu to see the pandas (a life long dream of mine 🙂 ).